Congratulations to DENNIS WOLF of Germany for his victory at the final Arnold event to be held at the historic Veterans Memorial Auditorium. USA’s Shawn Rhoden placed second with Cedric McMillan in 3rd place. In the Arnold Classic 212 it was a titanic battle between Flex Lewis and David Henry with FLEX LEWIS emerging as the first ever winner of the Arnold Classic 212. 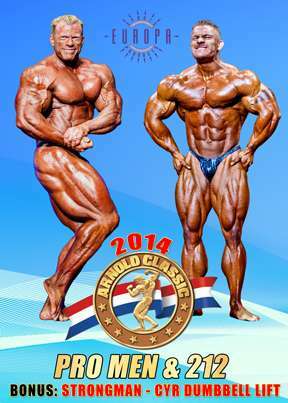 The 26th Arnold Classic was held at the Veterans Memorial Auditorium, Columbus, Ohio on February 28th & March 1st, 2014. The inaugural Arnold 212 Prejudging was held at the Greater Columbus Convention Center. The naming sponsor was Europa Sports Products. Both of the FINALS include all the posing routines, comparisons, posedowns and awards. Plus the Arnold Schwarzenegger Lifetime Achievement Award, presented to JOHN BALIK of Iron Man magazine. The Pro Finals concludes with the Arnold Strongman Classic Cyr DB Lift, with the overall winner’s award to ZYDRUNAS SAVICKAS of Lithuania. This was a multiple camera shoot using HD cameras at the Veterans Auditorium, and thus producing outstanding video quality. See the PHOTO GALLERY HERE. I would like to specially thank my good friend and long time helper at the Arnold Classic, JASON BREEZE, for these wonderful contest photos. The DVD commences with the Complete Arnold 212 Prejudging and Finals followed by the complete Pro Men’s Prejudging and Finals. Plus the Final Event of the Pro Strongman, the Cyr DB Lift, along with the winner’s award by Arnold Schwarzenegger to Zydrunas Savickas of Lithuania. 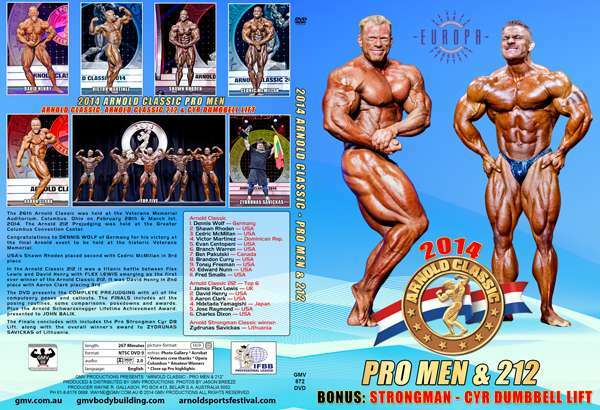 The last part of the DVD includes the Final Event of the Arnold Strongman Classic, the Cyr DB Lift. See the complete Cyr DB Lift contest, along with the winner’s award to ZYDRUNAS SAVICKAS of Lithuania.